Butterflies rest on flowers planted to attract them for the annual Butterfly Festival at the National Butterfly Center on Saturday, Nov. 3, 2018, in Mission. The monarch butterfly migration is upon us. The iconic insects with the stained-glass orange-and-black patterns were a welcome sight to the many visitors to the 23rd annual Butterfly Festival this past weekend at the National Butterfly Center in Mission as they fluttered their way toward their winter roosts in southern Mexico. People who follow the monarchs have issued good news-bad news reports of late. The good news is that early fall numbers indicate their populations are on the rise from spring counts; the bad news is that the spring numbers were alarmingly low, showing a nearly 15 percent reduction from 2017. Totals were around 10 million, only 10 percent of 1997 populations of a billion or more. There’s no telling how those numbers will be in the spring when the insects return to their summer homes throughout the United States. Officials with the U.S. Fish and Wildlife Service reported that heavy storms and unseasonably warm weather during last year’s migration contributed to the heavy attrition, and those factors can’t be controlled. Other, mostly manmade factors are a more constant threat to the monarchs. The butterflies roost in the same evergreen groves every year, and logging in Mexico is reducing that habitat. In this country, heavy pesticide use kills many of the insects and herbicides reduce milkweed, which is the only source of food for monarch caterpillars, and pollinating plants upon which the adults feed. Such chemicals also contribute to reduced populations of bees and other insects that local farmers need to pollinate their crops. The Rio Grande Valley is on the monarchs’ migratory path, so local residents and officials surely share a special appreciation for the colorful creatures — and recognize the obvious incentive to protect them. 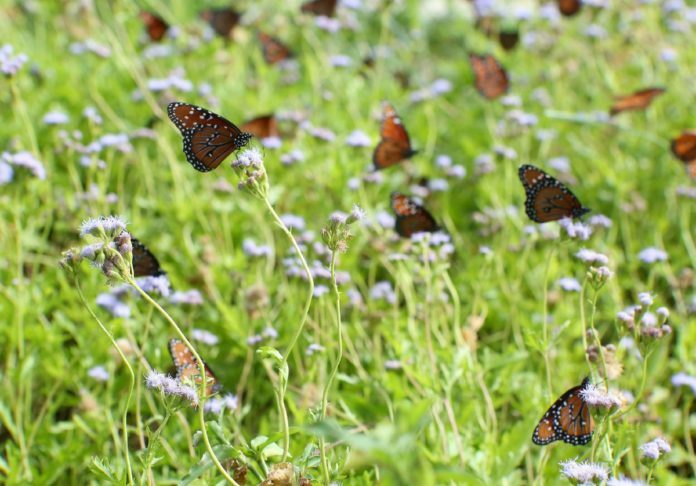 This area has become a haven for environmental tourism; people come to South Texas specifically to see monarchs and other migrating insects and birds, as well as other animals whose only U.S. presence is in this area. Local residents can help those creatures, and support the economic benefits, by taking a few simple steps. For example, they can plant milkweed and pollinating plants to attract and support the insects. They also can work with local officials to plant them in public areas, such as along hike-and-bike trails, around resacas and nature parks. Most importantly, they can look for natural ways to control weeds and pests to reduce the use of poisons that inadvertently kill butterflies and other benign creatures. These are small steps, but they can add up to a better chance for monarchs and other pollinating insects to reverse population reductions and continue improving and enriching our lives.